Advanced Dungeons and Parenting: Dungeons and Dragons: 5th Edition and "Zones of Control"
Dungeons and Dragons: 5th Edition and "Zones of Control"
Back in 2012, I wrote a blog post discussing how every edition of Dungeons & Dragons had miniature use as a part of its default mechanics assumptions. Let me repeat that in clearer language. Every edition of Dungeons & Dragons is a miniatures based tactical role playing game. 1) None of the 1st Edition AD&D campaigns I've played in has ever used the Weapon Speed Factors or the Modifications for Armor Class. 2) I've played in 1st Edition games that used "Spell Points" for spell casters. 3) As a Game Master, I've disallowed non-Lawful Good Paladins in 3.x and 4e. 4) I had a DM who used Arduin's Damage System in his AD&D Campaign. 5) I've never used the initiative system from Eldritch Wizardry. 6) I give every race a second wind as a minor action (Dwarves get it as a free action) to speed up play. 7) One campaign I played in had us set our miniatures on the play mat in "Marching Order." No matter the shape of the room our characters were attacked based on that formation in Bard's Tale-esque fashion. We could have been in the center of a room 100' x 100' and all of the melee attacks would have been targeted at either the front row or the back row without anyone attacking our Magic Users in the middle. Every one of the games I played with these groups was fun and thus none of these groups was playing "wrong." None of these groups played games to the rules as written either. No one - with the exception of organized play - should play to the rules as written. Role playing games are written to be adapted to play for your local gaming group. There are two key elements that allow for this without "breaking" the game. First, there are no winners and losers in D&D. The only way to win is to have fun and changing the rules for your local group is one way to create fun. Some changes are fun for a short time before they create more boredom than fun - in general - so there is room for advice regarding power scaling and Monte Haul campaigns, but the aim is to maximize fun. 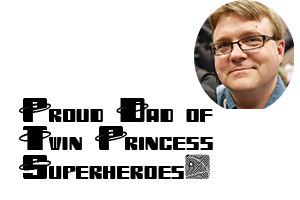 Second, most role playing games - excepting a couple of innovative Indie games - have a Game Master who moderates the game and who has absolute authority in rules interpretation in the local gaming group. So long as the Game Master is fair and focuses on keeping the game entertaining for the players in his or her group, then what rules are included or left out don't matter much. Original Edition (Chainmail): Once engaged in melee a unit was stuck until death or a failed morale check. 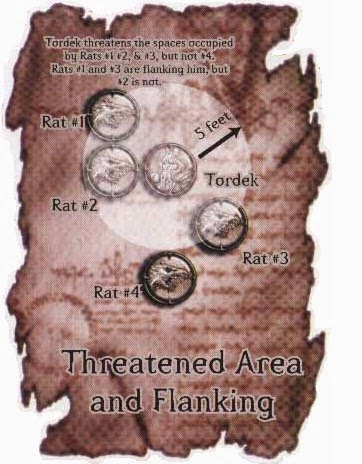 Original Edition (Alternate Combat): Not locked in combat, but adds "flanking" rules in Greyhawk Supplement. Swords & Spells supplement adds attacks of opportunity. 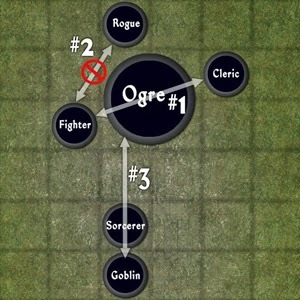 D&D Basic (Holmes): Attack of Opportunity against those leaving combat. D&D Basic (Moldvay): Adds "Defensive Withdrawal" similar to "5 foot move" or "shift" in later editions. 3rd Edition D&D: See image below. 3.5 Edition D&D: See image below. 4th Edition D&D: See image below. 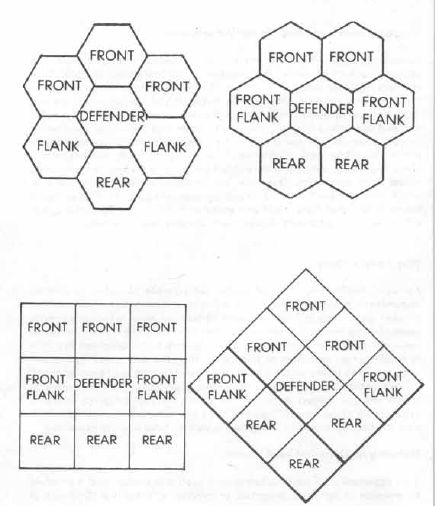 Each of these editions demonstrates the influence of tactical wargames on the combat systems of each edition. It should also be noted that each edition of the game adds new layers of complexity regarding what affects whether you are in a Zone of Control and whether you are flanking an opponent. Pathfinder, 3rd Edition, 3.x, and 4th edition all have creatures with reach that expands their Zones of Control and each of those games has specific rules regarding how conditions influence your ability to flank other combatants. If you read the earlier article and examine the pages of the 1st Edition DMG you will see that there are rules similar to those implemented by later editions, but you will also wish that the earlier edition had created cool graphic representations like those of later editions. 5th edition (in the Basic Rules) takes a big step away from the trend and is even more abstract than the earliest editions of the game with regard to flanking. I would argue that 5th edition is the first edition with takes "no position" with regard to miniatures and carefully crafts descriptions so that combat can be run either way without house rules or dropping rules -- though it does still refer to "squares" from time to time. The new edition still includes Opportunity Attacks - a firm Zone of Control concept - as described on page 74. But instead of listing a specific amount of distance moved as in Moldvay, 1st AD&D, and later editions it merely lists the need to use the "Disengage" action. The Disengage action can be used with a tactical map, but doesn't require one as it is more narrative in its description than the older "Defensive Withdrawal." The Rogue class on page 27 hints at the flanking rules for 5th edition which does not seem to entail a good deal of examining to see if combatants align properly on opposite sides of an opponent in a way that require illustration. 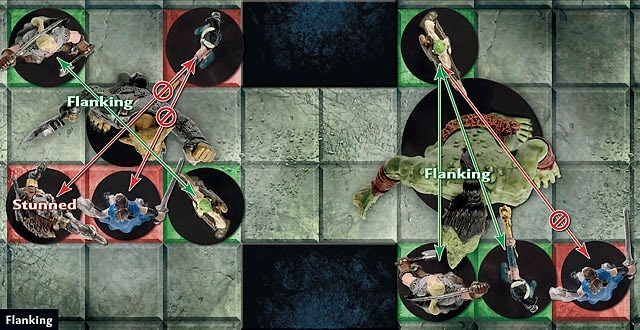 Under Sneak Attack, the Basic rules state that you can deal extra damage if you have advantage OR "if another enemy of the target is within 5 feet of it, that enemy isn't incapacitated, and you don't have disadvantage on the die roll." That's a pretty big shift toward simplicity and away from map use. 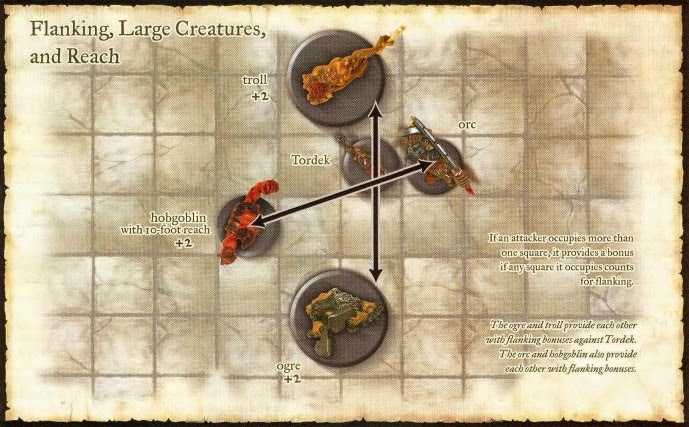 While it could be argued that the 5 foot rule implies the use of maps, one could easily assume that a creature engaged in melee has an enemy within feet. If this replaces needing opposite sides for advantage, this is a boon for mapless gaming. It is easily adaptable regardless. So what does this make 5th edition's Zone of Control rules based on the Basic Set? 5th Edition D&D: Attacks of Opportunity (strong ZoC) and potentially with Flanking if another enemy of the target is within 5 feet of it.